Scotland hotels, holidays and accommodation by Madbookings - Scotland online, hotels, holiday cottages, camp sites and places to stay in Scotland. Welcome to MadBookings.com, an online travel service and information resource for Scotland, helping you discover the magic of Scotland from the Lowland Lochs to the Majestic Highlands. Find the perfect place to stay and the best deals through our comprehensive accommodation and hotel listings, crofters cottages to castles they are all here. Scotlands Holiday, Hotel and Accommodation guide, information, prices, photographs and more of where to stay in Scotland, booking service for hotels in Scotland and vacation and holiday information on Scotland. There is no warmer welcome than a friendly Scottish welcome. With over 40 miles of magnificent coastline, golden beaches, rolling countryside, spectacular cliffs, award-winning tourist attractions and the world’s finest selection of links golf courses, East Lothian combines the best of Scotland in miniature! It may feel like a million miles away, but it’s only minutes from Edinburgh by car, train or bus! For many people around the world, the Highlands 'are' Scotland, living up to their picture-postcard images with majestic scenery, awesome wild places, towering mountains, ancient pine forests and broad expanses of dark and shimmering mysterious lochs. The Isle of Skye is one of the most popular tourist destinations in Scotland, for good reason: people come for the wildlife, history, geology, mind-blowing scenery, hill-walking and a variety of other exciting outdoor activities, Skye will live with you forever. 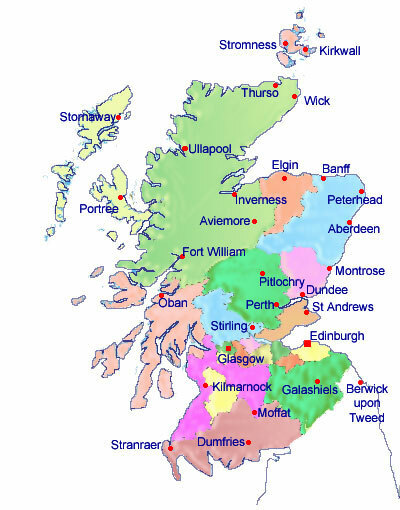 Perth and Kinross is situated at the heartland of Scotland. 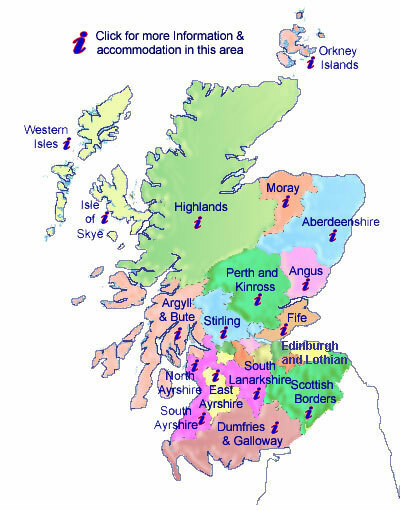 The Highland Boundary Fault Line runs through the area creating lowlands and highlands within the region. Lochs, mountains, castle ruins and whisky distillerys dot the region. Aberdeenshire is a diverse area of commuter towns, agricultural land, valleys and upland areas that get higher as you go east towards the peaks of the Grampian Mountains. Bordered by the River Dee in the south, and the Grampians mountains to the east. Stirling Castle, once the residence of Scottish kings, perches atop a long-extinct volcano, trailing behind it the exquisite architecture and cobbled streets of the citys Old Town. Modern Stirling bustles with activity and offers fine shopping and leisure facilities and historic attractions. A rich mixture of urban and rural, stretching from Glasgows suburbs south to the open moorland of the Leadhills, the lush Clyde Valley. This is an area steeped in history and many of the towns in the regions have a range of excellent attractions allowing you to explore their past. Situated on the beautiful Clyde Coast, Ayrshire and Arran is a holiday destination that is as exciting as it is peaceful, and as fascinating as it is fun. A mecca for all golfers with over forty quality courses, It is also home to prestigious heritage and visitor attractions. Dumfries and Galloway is the perfect escape from the stresses of modern life. Few can remain unmoved by the unspoilt beauty of this corner of Scotland. Admire the ancient ruined castles and monuments that set the imagination alight with their whispered hints of what life used to be like. Argyll is a dramatic county in the west highlands of Scotland, though within easy reach of Glasgow. The terrain ranges from the wild mountain scenery of the interior down to rugged and beautiful coastline and offshore islands. A diverse area of rich culture and contrasts. Uncover a different part of Scotland, where two thousand years of magic, mystery, and romance, are interwoven across a land as unspoiled as it is rich in history, tradition and culture. explore the legacy of ancient peoples, kings and queens, adventurers and inventors. Whisky, wildlife, snow, skiing and spits: from the beaches to the mountains, unspoilt Moray is a very interesting region to visit in the north-east of Scotland. East of Inverness and Nairn, the sheltered Moray Firth opens up as it heads out into the North Sea. Ancestral home of Scottish monarchs, world-famous for its golf and with some of Scotland's best scenic attractions, The Kingdom of Fife is a proud region with its own distinct identity. Home to Scotland's capital for six centuries, Fife has always been at the heart of the nation's history. Orkney is one of Britain’s most distinctive holiday destinations - a scattering of green islands where the past seems ever present. As well as the thought-provoking monuments to vanished peoples, Orkney is also great for wildlife, seafood, angling and gentle touring. With its unique culture, stunning seascapes and wildlife, Shetland is an entrancing blend of Scotland and Norway. The scenery is surprisingly varied for such a small area and is often truly spectacular. Rocky crags, heather hills, fertile farmland, sand dunes, pebble beaches and stupendous cliffs.